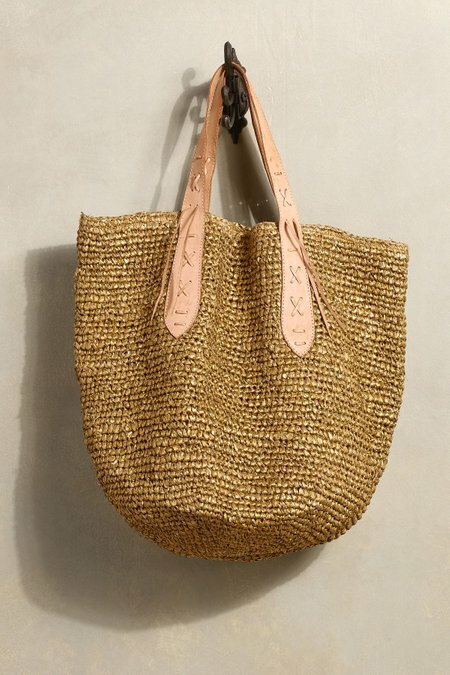 Natural raffia is all aglow with chic metallic sparkle in this textural hand-crocheted tote - an attractive take-along for shopping, beaching or traveling, fashioned with contrasting smooth tan leather handles with on-trend lacing detail. The roomy interior is fully lined with one interior pocket. Closes with a snap. 20" wide, 18" height, 12" depth, 8" handle drop.